I recently got a tiered circle skirt at an estate sale for a dollar or two. It seems to be a square dance skirt and is made of sturdy cotton. I did wear it once as-is, but it was a bit long on me and I was not a fan of the natural cotton color. I promise it wasn’t this wrinkled when I wore it. The light color also made it a bit more sheer than I prefer. My first step in the transformation of this skirt was to remove the lowest tier. This took forever–there is a LOT of fabric in this skirt. Removing the bottom foot or so of fabric made it a lot less overwhelming in length and weight. The next step was deciding on a color to dye it. I thought about a nice bright cobalt or deep red, but since the skirt style is a little out of my comfort zone anyway, I decided to go with black so it would blend in with the rest of my wardrobe. Finally, I sewed up the hem using another estate sale find, this beautiful vintage Necchi sewing machine. I bought regular old Rit dye from the supermarket–I chose the liquid version and followed the instructions for adding salt and dish soap. Unfortunately I didn’t do it perfectly, because it came out as a dark purplish-blue. I do kind of like this color, though, so I’m debating whether to redye it to get the deep black I wanted or to leave it like this. I also took the opportunity to dye another estate sale find. I purchased some pale peach silk culottes for a couple of dollars, thinking that if I didn’t wear them (again, a bit out of my comfort zone), I could use the silk for another project. I did end up wearing them twice, but was not in love with the color. Here is a bad mirror selfie to give an idea of what they originally looked like. I was a bit nervous about dying silk so I read a bunch of tutorials. I used black Rit dye for these as well, but ended up loving the deep purplish-blue color that they turned partway through the process. I can’t believe how beautiful they are now and I can’t wait to wear them! I also dyed a white shirt that I bought on Amazon and stained with tea the first day I wore it. Who would have thought that $3 bottles of dye could be so much fun? Last year I bought a pale aqua Pendleton wool skirt suit from Goodwill for something like $8. I am unsure of the suit’s vintage, but the color and style of the skirt suggested that maybe it dates from the late ’70s to early ’80s. 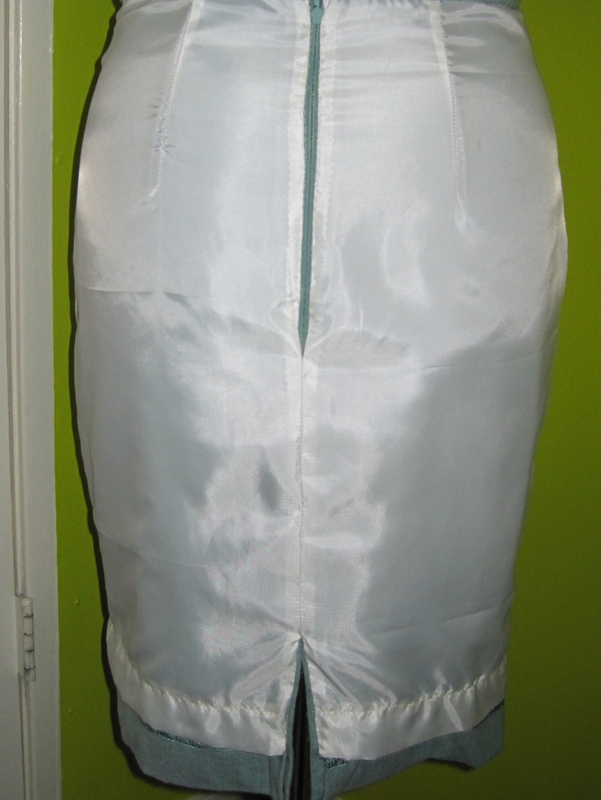 While the jacket actually fits pretty well, the skirt was long and rather frumpy, and the waist was impossibly tiny. I was sure I photographed the skirt, but I can’t find the photos, unfortunately. It was gathered slightly at the waist and had a large pleat in front. It was ingeniously constructed with pockets and only a button at the waistband for closure. Despite the tiny waist, there was a lot of fabric to work with, making it a perfect candidate for conversion into a pencil skirt. I cut off the waistband and unpicked one side seam and the back darts, leaving me with a big rectangle of wool. I used the pencil skirt pattern from Gertie’s New Book for Better Sewing, since I had been successful with it in the past. As before, I shortened the skirt by a few inches. I also decided to make a plain waistband rather than the curved one in the pattern, so I didn’t need to use boning. With careful positioning, I was able to preserve the skirt’s original hem. I used just about every inch of the fabric. I spent more time on this than on anything I’ve ever made. I added a lining (I had to buy new fabric for this, as the original lining wasn’t big enough to reuse) and hand-picked the zipper. 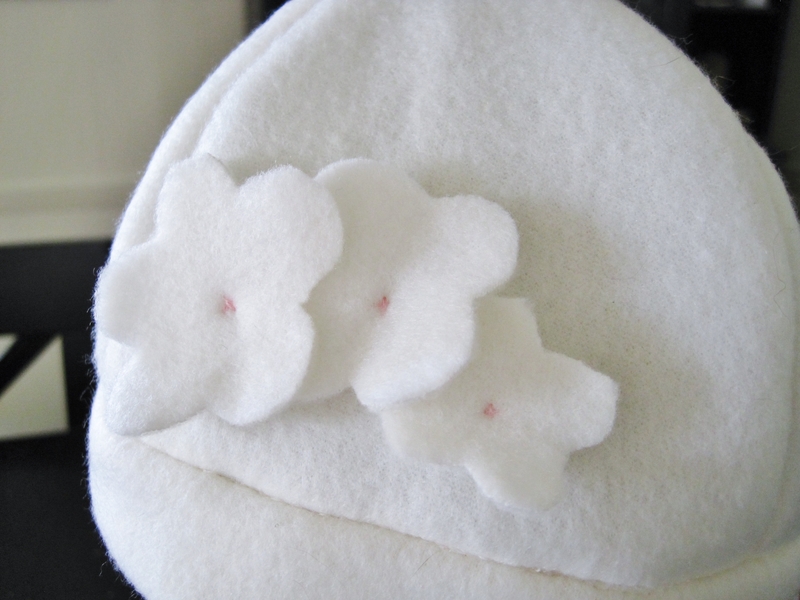 There was a lot of hand sewing with this project–usually I hate hand sewing, but the results were worth it. And the wool was a dream to work with. While there are a few issues, mostly with the waistband, I am delighted with this skirt! I love the way the lining makes it look so much more finished and professional. I will definitely be lining my skirts in the future. We are doing some spring cleaning, which includes going through all the boxes in our closets and basement with the goal of having an epic yard sale and getting rid of lots of junk. I am a big-time clothes hoarder, with boxes of clothes that I hang on to either because I hope to fit into them again one day (not likely to happen anytime soon) or because I am emotionally attached to them. I have recycled some of these old clothes into new ones or into other projects, but for the most part they just take up space. Although T-shirt quilts are maybe a bit cheesy, making one seemed like a good use of all the T-shirts I will never wear again. I collected a big pile of these: shirts from schools where I taught, my high school graduation shirt, a couple of band shirts, and some other old favorites. Jared pitched in a few as well. There are many tutorials for T-shirt quilts online, but they pretty much start the same way: cut away the sleeves and separate front from back, iron on fusible interfacing for stability, decide on a size, and cut. Pretty simple. I saved the unused side and sleeves of each shirt for rags. I bought 6 yards of lightweight fusible interfacing at 99 cents a yard. This should have given me 12 18-inch lengths of interfacing, but since I didn’t measure very carefully, I ended up with only 11. I also had more T-shirts than I thought, so I’ll need to buy more. After ironing on the interfacing, I measured the largest designs and decided to cut 15-inch squares. With a half-inch seam allowance, they will measure 14 inches square in the final quilt. I made a template of newspaper and checked the placement carefully, trying to center the design. This wasn’t always possible, as many of the designs were too close to the neck opening to work, but I did the best I could. At the end of the night, I had 11 squares ready; the rest of my pile will have to wait until I buy more interfacing. Here are a few of my favorites, including the anarchy shirt that I loved in high school (I thought I was such a badass), my high school graduation shirt signed by everyone in the class, a school tie-dye shirt from my elementary teaching days, and my beloved Tripping Daisy shirt. A couple of the shirts were too small to fill out the square so I will have to find some way of filling them in or framing them with another material. I will also have to decide on a layout and choose whether or not to add sashing between the panels. Should be fun!